Today is Raw Milk Appreciation Day. Raw milk, another term for unpasteurized milk, is used for drinking and making cheeses. When milk is pasteurized (heated to more than 100°F/40°C), hundreds of varieties of beneficial bacteria are killed along with the potentially harmful ones. If left alive, those good bacteria interact with the milk to provide significantly more complexity and depth of flavor to the cheese. That’s why many connoisseurs prefer raw milk cheeses. 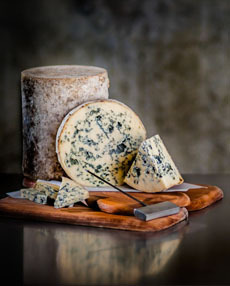 Due to rare but potential illness from unpasteurized milk, the FDA restricts the distribution of raw milk cheeses aged less than 60 days*; although raw milk cheeses are readily available in Europe. So you can buy raw milk cheese in the U.S., just not fresh ones (for example, no fresh goat cheese or Camembert). The restriction also applies to imported cheeses. Despite modern sanitation, there are still some questionable practices in industrialized dairying. This bloomy-rinded cheese from New York State is aged for 60 days, just enough to be legal in the U.S. It’s made by Vulto Creamery in Walton, New york. Photo courtesy Murray’s Cheese. Raw milk may still harbor a host of disease-causing organisms (pathogens), including E. coli, Listeria and Salmonella and Staphylococcus aureus. A small number Americans become ill each year from raw milk-related causes; in the past, there have been periodic related fatalities in Europe. How did mankind survive thousands of years of eating unaged raw milk cheeses? They did it before the scourge of food industrialization. With the shift from farm to factory, there was an increase in foodborne pathogens. In industrialized production, cows are crammed into feedlots (rather than those that graze in meadows) have a greater risk of carrying pathogens. Milk from different farms is delivered to a central processing facility. There is a much greater risk that one or more farms delivers contaminated milk. The U.S. government instituted policies to ensure that the milk, cheese and other dairy products were not harmful to human health by insisting on pasteurization for drinking milk and young cheeses. Many of today’s small farmers feel that fresh milk from healthy animals, handled in a responsible manner and used immediately, does not require pasteurization. They drink their own milk raw, because it is far more flavorful. As with other foods involving potential rare pathogens—Caesar salad, mousse (it’s made with raw eggs and not cooked), steak tartare, sushi and so forth, the decision to drink raw milk or eat raw milk cheese is a personal one. As outbreaks of E.coli from meat and vegetables prove, many “legal” foods are unsafe. 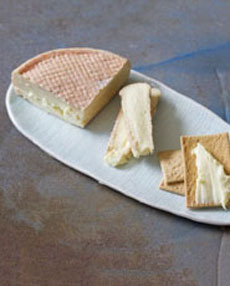 Head to a cheese store or a market with a good cheese department, and buy a selection of raw milk cheeses. They’re often not marked, so you may need a cheese specialist to point them out. Enjoy a cheese plate for lunch—with fruits, nuts, breads or crackers and a salad on the side—or after your main dinner course, instead of dessert. Have wine or beer with your cheese plate. After all, it’s a celebration! *The 60-days rule was established in 1949, with questionable scientific evidence. It posited that within 60 days, the the acid and salt in cheese would kill the harmful bacteria. But there have been outbreaks of pathogens in both raw and pasteurized cheeses. †It is illegal to distribute raw milk in the U.S., but the law allows consumers to go to a farm with their own containers and purchase raw milk. This is essentially ludicrous, as many who would buy it cannot get to the farms; and any containers brought from home will not be as clean as new ones used by farmers.